The last time we refinished the deck was back in April 2010, right before we put our house up for sale. It was starting to show signs of wear last year, but refinishing the deck just wasn't a priority. I finally tired of the same goldish beige solid stain we chose many years ago and it was peeling pretty bad, so something had to be done this year. We started working on the deck prep several weeks ago and it's been tough work, that is until this week because it has rained every day. The tile table top that Mr. Fanatic made is looking pretty bad and tomorrow we will be taking it apart and removing it from the deck. Mr. F made the table top after the original top was broken accidentally and I couldn't decide on a new patio set. (I really could decide, but didn't want to spend the money on the one I wanted) He is hoping to make me a brand new table this weekend, but I'm guessing it will take a little longer than that. We have removed the heavy terra cotta pots from the deck. We aren't getting any younger and these puppies are really heavy. Besides...there is something going in this place, which I'll tell you about another time. a deck color has finally been chosen! Can I get a Hallelujah???? How do you keep your deck or patio looking good? I love your deck...in any color. How cool about getting a new custom table!! We try and just keep ours clean and swept. The deck got stained and sealed last year but that was a job and a half. Can't wait to see the finished product and what the new table will look like! Very exciting but a lot of work I know. 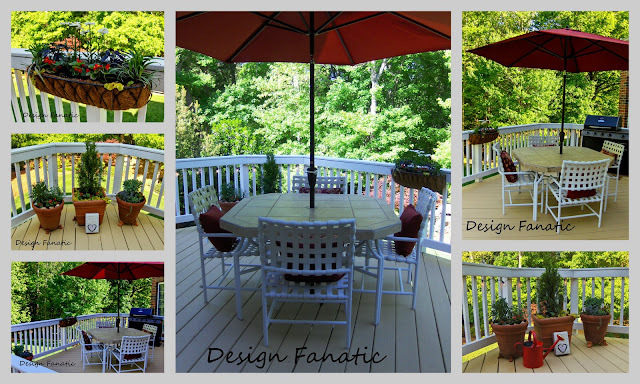 My husband used the new Rustoleum Restore products on our deck last month, and we LOVE the results! Our deck is huge(85x25), & it was in bad shape with splitting wood, popping nails, & moss growing in shady spots. We looked into replacing it, but even doing demo ourselves, cost would have been $8-$10,000! So, we procrastinated for 2 years, which was just long enough to discover this amazing new product. It cost just under $1,000 to resurface the entire floor, and use the matching stain on the railings & trim. It looks like we have a brand new deck! I couldn't be happier! Oh yes, indeed, I can certainly imagine the agony of choosing the color! It's SO visible!!! I'm bad enough with paint on the walls...living with splotches for up to a year...that this would put me over the edge! Can't wait to see!!! So pretty! We don't have a deck, just patio's. I have lots of potted plants sitting around. ahhh...looks so good Pam! Fresh and clean and ready. Love the color choice too. The deck looks great now and look forward to your changes!! !